This is my second opportunity to try out products from Beeyoutiful. Almost two years ago, I reviewed a product called Berry Well, which we really did like. A few weeks ago, I received Tension Tamer and Peppermint Lip Balm. I figure they must know me pretty well. Tension Tamer is billed as "the ultimate de-stresser" and as soon as I opened the package, I opened this up and rolled some on the back of my neck. I carry stress in my neck and shoulders, and that is where I have been using this. I immediately noticed the wintergreen fragrence, but upon reading the ingredients, there is also peppermint and eucalyptus for stronger-smelling oils. Other ingredients include oils like jojoba, sweet almond and grape seed. I simply LOVE that this is so natural -- no artificial fragrances, no preservatives, no petroleum. And three of us have had a chance to use it. I've used it the most. Like I mentioned above, I mostly used it on my neck. William used it one day when he had a headache. And Dale used it when he was feeling under the weather, tense muscles and a bit of a headache. My mom reacts badly to eucalyptus. I've never really used eucalyptus as a result. And after using Tension Tamer, I think I was right to avoid eucalyptus. Dale's experience was far better than mine. He said that he could feel it working almost immediately. So this is a product that I am thrilled to let my family use, but I will avoid it for me. And at $11 for a bottle that seems to last forever, I will get more. 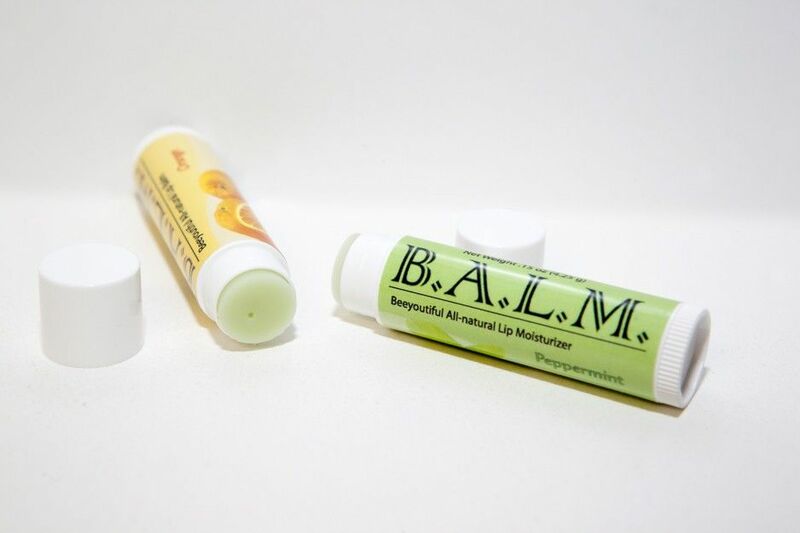 I also received Peppermint Lip B.A.L.M, a brand-new product. This I loved... especially because it smells peppermint-y but doesn't taste it. This all-natural product is fabulous. Shea butter, beeswax, grape seed oil, and in the case of the one I received, peppermint essential oil. Orange is also available. The lip balm feels good, and it feels healthy. It feels healthy for a reason -- anti-oxidants, anti-inflammatory, antioxidants... all kinds of great stuff. This is something I will certainly toss into my cart when I order from Beeyoutiful in the future. And although this was not part of my review products, I also have some of their Hair Shine -- and I can rave about this one too. I've been using that on Trina's hair and it is fantastic. She thinks the citrus-y scent is a bit too strong, but in the week that we've been using it, not only is her hair easier to brush but it feels more healthy besides. This is a spray-on, leave-in conditioner. I spritz Trina's hair with all-natural stuff like essential oils... and I brush through it. And, like I said... her hair is easier to manage after only a week. Hair Shine, right now, is available for $12.75. Disclaimer: As part of the TOS Homeschool Review Crew, I did receive some of the products mentioned above for the purposes of a review. All opinions are my own. For more about my take on reviews, visit my blog post here. As I was reading this comment I remembered I had the Tension Tamer and my neck has been all wonky this evening. I put it on my neck as you suggested and literally in a few minutes, my head felt better. That is crazy. LOL I am happy!